If nothing else, True Story reminds us that when he is not preciously playing at being a modern-day renaissance man, James Franco is one of the finest actors of his generation. Playing family annihilator Christian Longo, an Oregon man who killed his wife and three children, in Rupert Goold’s adaptation of journalist Michael Finkel’s memoir to chilling effect, Franco’s performance is his best since 127 Hours and the one compelling reason to see this drama that remains too firmly in Finkel’s corner to tell an effective story. A New York Times reporter, Finkel (Jonah Hill) thinks he’s headed for a Pulitzer Prize with his latest feature, a Times magazine cover story on exploited boys in Africa. Instead, when his editors find out that he conflated characters and otherwise “improved” his story in ways that cross over into fiction, he’s fired, making him virtually unemployable as a journalist anywhere else. Retreating to his girlfriend Jill’s (Felicity Jones) Montana home to lick his wounds, the first ray of light in his new life is a phone call asking him comment on the Longo story. After his crimes, Longo lit out for Mexico where he claimed to be the NYT reporter until his capture. Intrigued, Finkel arranges to visit the alleged killer. A weird friendship is born. Finkel sees that there is a book to be gotten out of their meetings that might restore his reputation. Longo, too, realizes that there are things to be gained from continuing to see Finkel. It is a relationship of mutual utility. 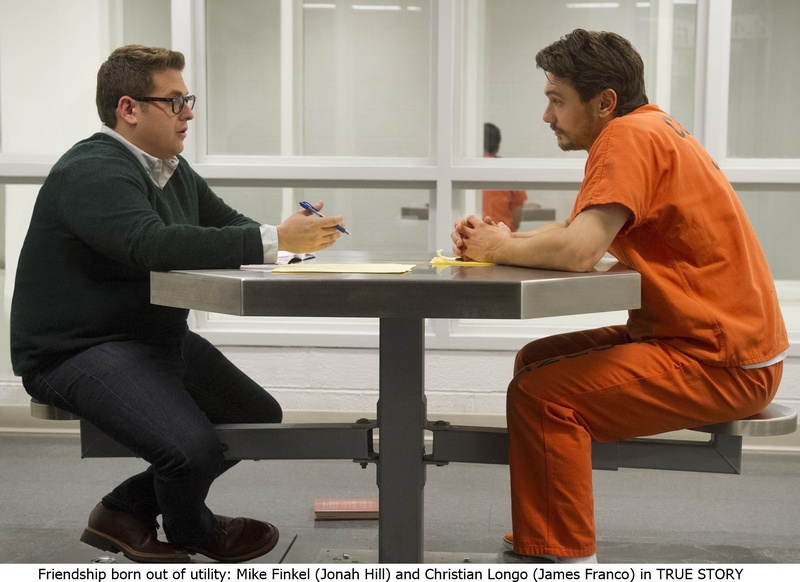 Certainly, there is charm to Longo as Franco plays him, but with his dead eyes, evident narcissism and unlikely explanations for what happened to his family, the police, the prosecutors and even Jill see right through him. But not Finkel, who may think he’s about to write the next In Cold Blood, but for too long buys into Longo’s unlikely explanations. Is he fooled by Longo’s flattery (Longo claims to be a fan and asks Finkel to help him become a better writer)? Or is he fooling himself in his focus to fulfill the terms of his book deal?